My sushi fantasy has finally come true! 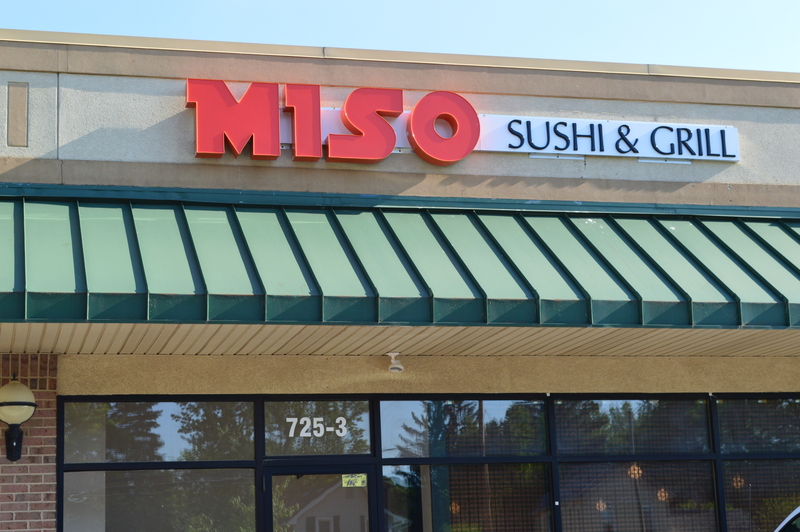 Miso Sushi and Grill restaurant has opened in Williamston and it’s right next to where we live. No more driving all the way to Okemos or East Lansing for some Asian delights. It’s right along Grand River Ave beside the popular breakfast place, Sunnyside Cafe. 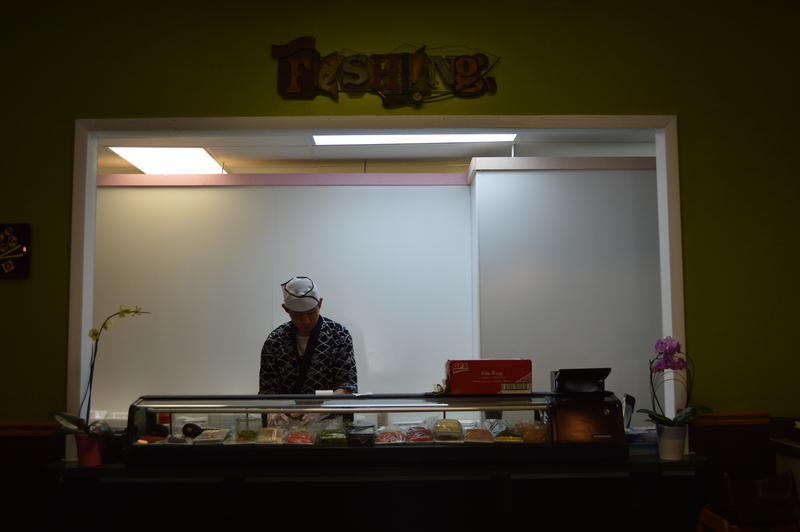 Expect nothing but awesomeness from a chef who has had 10 years of experience with sushi and Asian fusion food. Chef and owner Mr. Sang Shul Han, from what I’ve learned, previously shared his culinary skills at famous Japanese places–Omi Sushi in East Lansing and Maru in Okemos. Just take these two restaurants as a perfect example of how the menu and servings are like at Miso Sushi. The restaurant interior is small with fewer than 10 tables, and I was a bit disappointed that it didn’t look much like a Japanese restaurant at all. Brown wooden tables with tiny seashells underneath the glass and matching ordinary brown wooden chairs. I just kinda expected the place to be more like its counterparts in the other towns. Part of the experience in eating at foreign restaurants is the atmosphere that makes one feel like you traveled far and landed at a foreign country. But hey, we come here for the food, right? 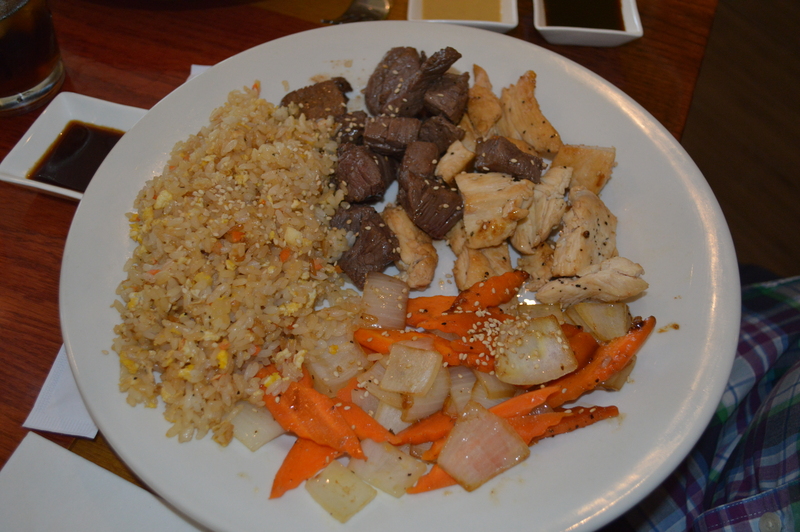 And as long as our bellies are filled and our taste buds like what they’re sensing, it’s all good. There’s the chef busily slicing up some salmon or tuna and rolling it up in nori (seaweed). It’s a must to have the fish meat and other sushi ingredients within sight of the customers to show how the sushi technique is made, and it becomes a testament of the freshness of the dishes being served. Unfortunately, the two times I was at Miso Sushi since its opening a couple of months ago, I never had the chance to order my favorite sushi rolls. Every time Kyle and I were here, I was too hungry that sushi wouldn’t be a complete meal for me. Well, one day, I shall try them (and I already know it’s gonna be good!) 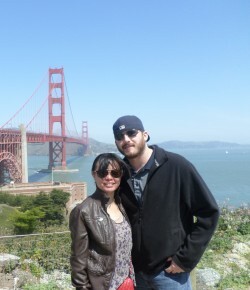 and post the pictures here. And this brings me to another point. Their menu is a little bit too expensive, especially for a small-town restaurant. It also surprised me that they didn’t have any lunch specials. The plates offer big servings though, so that’s an upside. But with all the competition in Williamston and nearby Okemos, their prices could do much better. So again, have some lunch specials, please! 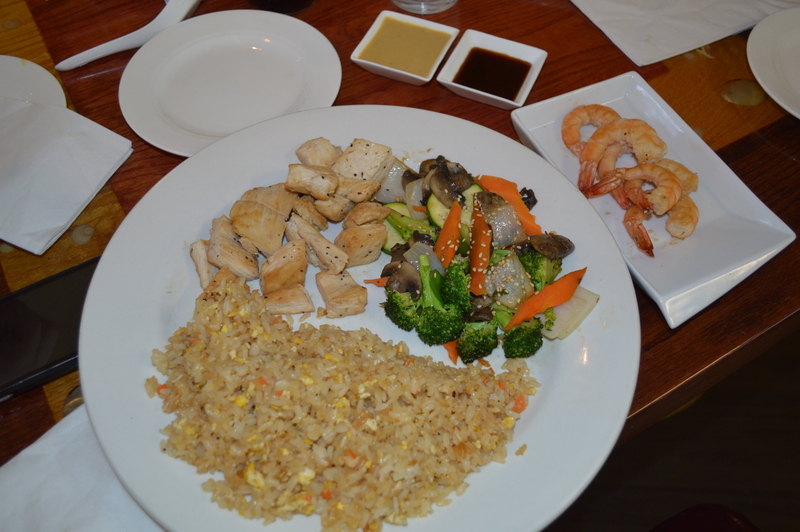 Since Kyle seriously abhors seafood and never orders anything from a Japanese restaurant, I asked for just a plate of grilled chicken and shrimp with a side of fried rice and vegetables from their hibachi menu. 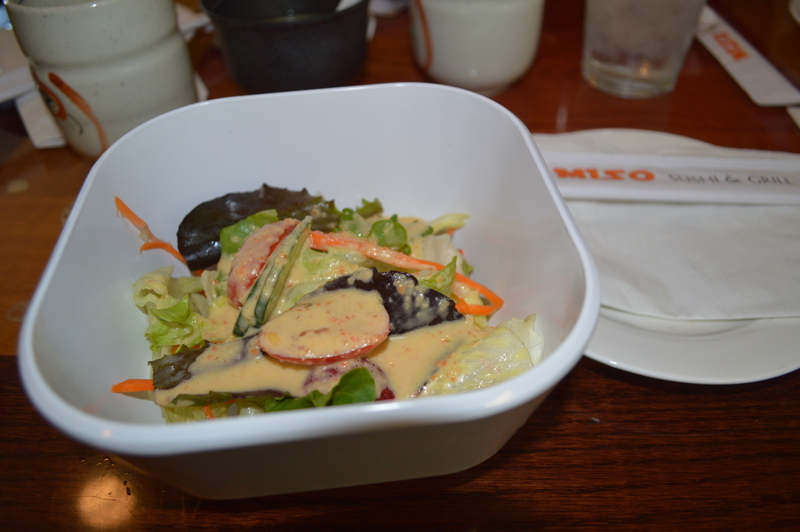 The miso soup and salad come with the meal, and even though it was just me who ordered, they were generous enough to still serve Kyle these appetizers. We’ve never had this kind of service before! Only here! And although Kyle isn’t a fan of the miso soup (or any soup for that matter), he cleaned up his salad bowl in just a short time. Believe me, that’s saying a lot. I had to ask them to set the grilled shrimp aside so Kyle could try out the chicken. 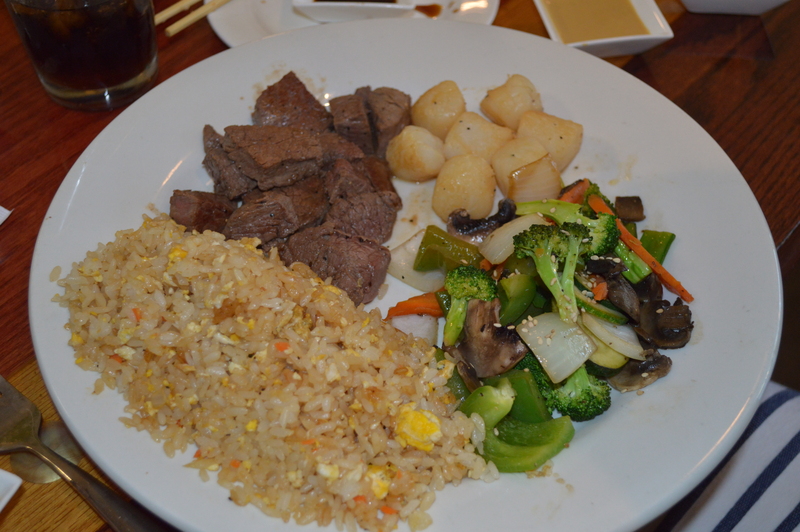 This looks like a well balanced meal, doesn’t it? And the fried rice? Umm. THIS is how real fried rice is cooked, unlike some Chinese restaurants that serve bland yellow rice. If you’re still nervous about going into a Japanese restaurant because of the raw fish, you don’t have to because Miso Sushi totally have lots of exciting choices that you have to try. And how about alcohol? Well, you’ll be glad to know that the owner has purchased the last liquor license available in Williamston, so we should be seeing some beer and wine variety, especially the world-famous Japanese beer sake (rice wine with 15 to 20 percent alcohol content) soon! I’m a HUGE fan and will definitely come back for more and try out every single dish in their menu. 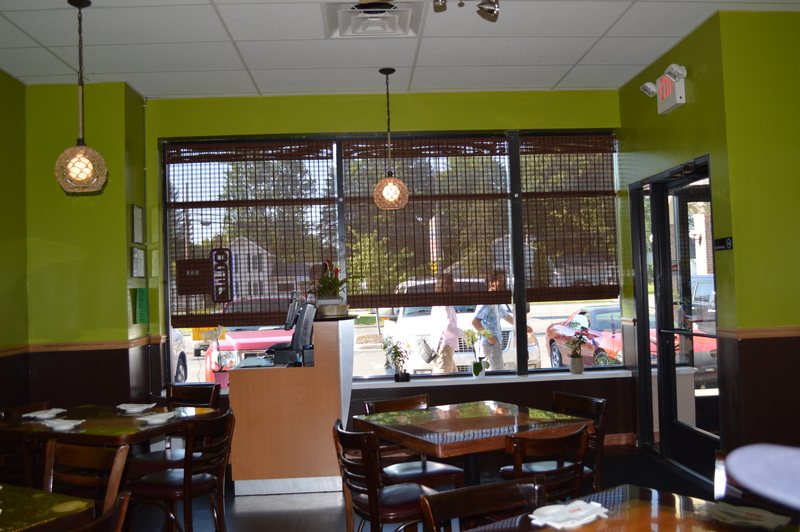 Food and service were great, and they definitely give extra attention to their customers. If you’re ready to try something different from pizzas, burgers and orange chicken, this is where you should go. It makes me sad that they are not open on Sundays though. That day of the week when I’m too lazy to cook and want to eat out. Oh well, at least they’re just a stone’s throw away from our house and we now have an extra option for dining places in Williamston. And here we are with Eric and Anne for a double date at Miso Sushi and Grill. They’re the absolute best pair to invite when it comes to trying out Asian restaurants, and this is just one of our food quests.